I encourage you to try this if you’ve been hesitant about using phyllo dough. The recipe includes expanded directions and tips, but if this is your first time working with phyllo and you haven’t read the Beginner’s Guide to Phyllo, you might want to check it out. Note: Defrost the phyllo dough in the refrigerator the day before. 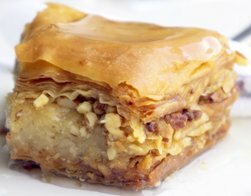 Bring the phyllo to room temperature before beginning, and do not open the package until the filling has been prepared and you’re ready to start making the pastry. When you do open it, keep unused portion covered with a piece of waxed paper and a cool damp towel. Make the filling: Combine the ground nuts, sugar, and cinnamon in a bowl and stir until well blended. Make the pastry: Work on a clean, dry, flat surface, with melted butter, a pastry brush, and a 1/4 cup measuring cup at hand. 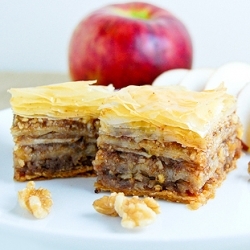 Phyllo sheets are generally 14 x 18 inches, and you’ll work with the short side toward you. This is made with 2 phyllo sheets per layer. Take 2 sheets of the phyllo. Lay on the surface and brush very lightly or dab with butter from the edges inward (or use the butter-flavored cooking spray to lightly cover edge to edge). Lay one sheet on top of the other and sprinkle 1/4 cup of the filling over the entire surface of the phyllo. Take 2 more sheets of phyllo and repeat, brushing with butter, sprinkling with 1/4 cup of the filling. Repeat until you have used 8 sheets, and the top layer is sprinkled with filling. When brushing with melted butter (or spraying) use a light hand and just sweep across the phyllo. It shouldn’t be soaked. Starting at the edge of the phyllo facing you, roll it up carefully, like a jelly roll, and place seam side down. With a very sharp knife, cut the roll into 6 pieces equal in length. Repeat with all rolls. The 32 sheets of phyllo dough will make 4 rolls, each cut into 6 pieces for a total of 24 pieces. I find it’s easier to cut the roll in half and then cut each half into 3 pieces. Put a clove on top of each piece, place pieces filling side up (so the filling shows) in a lightly buttered medium-sized baking pan with high sides, and spoon one teaspoonful of melted butter over each piece. The pieces should fit snugly, but not squashed, together. Use the clove (that will be on the side) as a guide to how close the pieces should be. Baking – A Process: Bake for 30 minutes at 390F (200C), then for 30 minutes at 300F (150C), then for 30 minutes at 210F (100C). Finally, turn the heat back up to 390F (200C) at the end to give the tops a good dark golden color. Remove from the oven and allow to cool in the pan. Make the syrup: Wait until the baklava has cooled to make the syrup. In a saucepan, combine the sugar, water, and stick of cinnamon and boil for approximately 5 minutes, stirring, until the sugar is completely dissolved and the syrup has started to thicken. Stir in the lemon juice and remove from the heat. Discard the cinnamon stick. Very carefully, pour the very hot (but not boiling) syrup evenly over all the pieces. Let cool in the pan to room temperature (several hours) before serving. Cooking note: My older family members say that great success depends on sticking to the scheduled cooking time, and the oven temperatures. It may take longer this way, but the results are worth it. Note about syrup: The general rule of thumb is hot syrup on cooled pastry, or cooled syrup on hot pastry (although this doesn’t always apply). 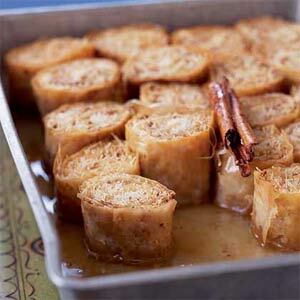 If you prefer, fix the syrup first, and let it cool while preparing and cooking the baklava. Then, when the pastry comes out of the oven, pour the cooled (at least room temperature) syrup over it, and allow the baklava to cool before serving.